A few weeks ago I watched videos and looked at pictures of Nelson (Santigie) Smith’s homecoming to the United States. On his second night home we got a Skype call at 11:45pm (because 16 year old boys don’t value time zones) and Charles and I got to talk and laugh with Santigie. We talked about his new friends, Chik-fil-a, the cold weather, watched him dance, and he not-so-tenderly corrected my Krio. My heart felt so full knowing he was sitting in a living room where I’ve sat, with people I love and trust so much. "My heart felt so full knowing he was sitting in a living room where I’ve sat, with people I love and trust so much." 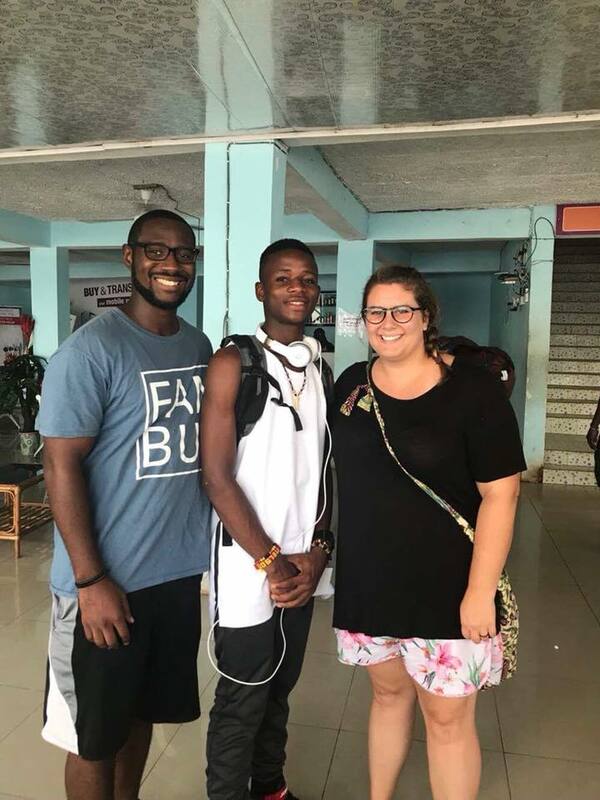 When Melanie asked Charles and me to write a blog telling City folks why they should travel I thought I would probably write some profound message about the lessons I’ve learned living in Freetown. "When I saw Santigie reach for Zach in the airport, I realized he did this because of something so simple; he already knew him." However, I saw a moment in Santigie’s homecoming video that pinpointed exactly what I want to say about why our City family needs to come meet our Sierra Leonean brothers and sisters. The moment wasn't when Santigie hugged his mom, or sisters, or his grandparents for the first time. The moment, instead, was when Santigie reached over and hugged Zach Roberts and then turned to the other familiar face in the crowd, and affectionately went to greet his ‘Auntie’ Angie. That moment seemed to freeze in my head and made me think of heaven again. I’ve been thinking a lot about heaven lately, partly because of my mom’s passing and partly because I’ve never felt so out of place in this world. I’ve begun to yearn for Christ’s coming to put to rest the pain, abandonment, and deep sorrow that has seemed to rule life’s turns this year. When I saw Santigie reach for Zach in the airport, I realized he did this because of something so simple; he already knew him. I immediately got excited about the day we all get to heaven. "That moment of connection Santigie had with Zach when he got off the plane is what we want for you all when you come; we want you to feel what it's like to have family across the world." Charles told me on Thanksgiving that he was most thankful for knowing that we could go anywhere in world and we would have family. Can you imagine that on the day you get to heaven, you'll recognize people? These people are not just your family or your Jackson people. These people you will greet will not just be your companions, but brothers and sisters from another country, thousands of miles across the world whom you’ve shared experiences with. Can you imagine greeting them with a hug and a kiss as you rejoice together in the goodness of our redeeming Savior? Can you imagine what it would be like to bask in the glory of the multi-ethnic family in heaven with faces you’ve seen before? We quote Revelation 7:9 in our church ALL the time. We say that we want every nation, every tribe, and every tongue to know and love the Lord. We fight for this mission to be be true on earth as it is in heaven. Isn't it important for us to fight to know those who will be in the multitude with us? We need to fight to know those who will cry out beside us, “Salvation belongs to our Lord!” That moment of connection Santigie had with Zach when he got off the plane is what we want for you all when you come; we want you to feel what it's like to have family across the world. I can’t tell you what kind of hope that will give you on days when your normal life is too much to bear. "No matter what happens with building our nuclear family, with building a new program, or with the complexities of the cross-cultural lifestyle we’ve chosen, we know we're investing in relationships that will literally span eternity."